Winter camping isn’t for everyone, therefore we have put together our top tips and hints to ensure your Vango tent doesn’t become damaged during the chilly months. As much as we love camping in all weathers, sitting in front of the TV is very appealing when the snow roles in! Packing you camping equipment away properly will extend the life of your tent, especially if you aren’t planning on using it for a few months. You will be extremely thankful when the camping season comes back around that your tent and other gear is still in fab condition. 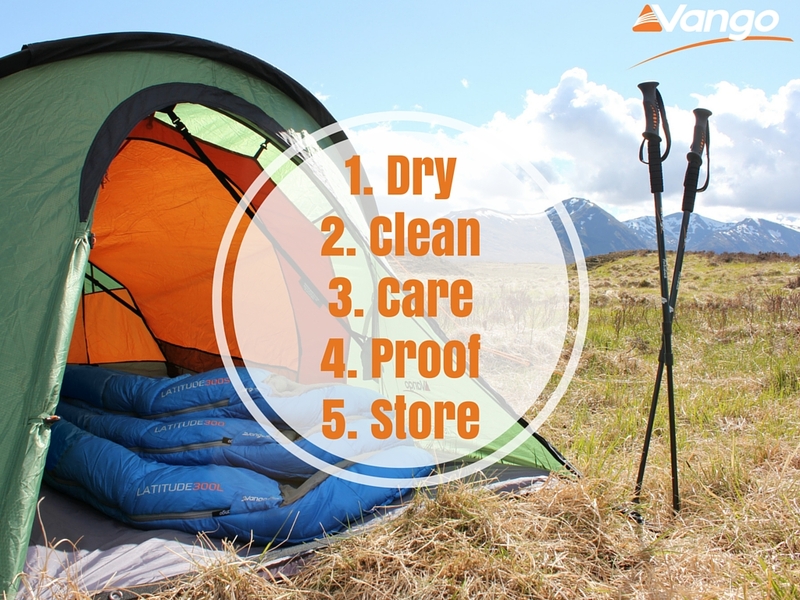 Below is some advice on how to dry, clean, re-proof and store your Vango tent in the best way possible, and some tips on storage methods for all of your other camping necessities such as furniture and accessories. This is generally the most important camping essential you need to take great care of if you wish it to last as long as possible. Not caring for your tent and storing it in the wrong kind of environment can drastically decrease the quality and lifespan of the fabrics. Having a damp tent is a big no no when packing away your equipment, therefore we recommend that your tent should not be left wet for any more than a couple of days. Leaving your damp tent for a long period of time can cause the fabric to rot, increasing the chance of holes appearing. Mould will start to grow encouraging your tent to get a bit whiffy and look unkempt. This further ruins the waterproof coating and could even cause your tent to leak on your next camping trip! How do I dry my tent? Campers with larger tents may find drying their tent more difficult than people with smaller tents, as finding a big, dry area can be challenging if the weather constantly lets you down. Pitching in the garden: this is the easiest, quickest and most beneficial way of drying your tent, however weather can be an issue especially at this time of year. If drying outside, make sure that once the flysheet is dry, you flip the tent over to dry the bottom of your tent. Ensure that when you flip, your flysheet is on a clean, dry surface. TIP – use your tent footprint or an old bed sheet to protect your flysheet. Washing line: hanging your tent over the washing line in the garden is a great way to dry out your tent, allowing the air to travel through the whole of the flysheet and inners. TIP – open all doors of the tent to allow air to escape, making it easier to fold and store. This will also freshen up your tent if odours are lurking. Stair banister/Shower curtain rail: these may sound a tad crazy but these methods will successfully keep your tent off the floor and allow water to drip or run off. If using this method, be sure to place towels to keep the carpet/floor clean. TIP – take out the inners of your tent if possible as these are made of breathable fabric and are more susceptible if mould does start. Garage: using this space with a makeshift washing line will dry your tent off reasonably quickly! Don't forget to open the door to enhance the airy environment. DON’T: Put your tent in the tumble dryer. This will not only damage your tent but also affect your dryer. The heat of the dryer can cause misshaping of your tent fabric, making it prone to ripping and melting parts of the tent. No one wants to be putting up a dirty, smelly tent when going on a family camping trip, so when your tent is completely dry, you should check for any dirt lurking around the groundsheet. You can eliminate debris by using wipes, a towel or brush. Another way you could catch the crumbs and dry mud is using a portable vacuum cleaner, however try not to use too much force on the fabric as this could cause damage to the groundsheet. TIP – Don’t forget to clean out any pockets in your tent. You should also clean the bottom of your tent, if you do not use a footprint. We highly recommend a footprint for this reason, as these can be easily scrubbed and hung to dry! Before re-proofing and packing away your tent you need to check your tent for any tears or mildew appearing. If any rips or tears occur, be sure to repair them, so that they don’t get worse – be patient and take your time with repairing. Take a visit to our sister site Camping Spares for repair kits. If the unfortunate does happen, and it is not covered in the Vango Warranty, then you may have to go through with a self-repair, or send it away to be repaired. Register your products to extend the warranty by an extra year! If you wish to cover small holes in your flysheet / groundsheet the best way to repair them is to use the repair swatches provided and a self-adhesive repair patch (we recommend Tear Aid). If mildew appears on your tent take action to eliminate the chances of the mold spreading. We recommend Milton’s sterilizing fluid, which works best well diluted and sponged onto the fabric. This will not remove the mold, however it will decrease the dispersion and bad smell. Re-waterproofing your tent restores the fabric and also aids to protect against UV degradation, thoroughly improving the lifespan of your tent. We recommend Storm Waterproofing for this, which can be purchased from most specialist outdoor shops. How to use Storm: To make sure you have enough for your tent, we recommend buying a bulk bottle, and decanting it into a hand held spray gun (the kind you would use for watering house plants). Before you start, lay the tent down flat or pitch in the garden (which may be easier as the flysheet will be taut). Spray the solution onto the outside of the flysheet and catch any drips or runs with a sponge. The location and storage method is very important if you want to take good care of your tent and use it for a long period of time! You should store your tent in a cool, dry environment, packed slightly loose and roughly rolled the same as when you first unpacked it. Poles, pumps and other tent accessories should be kept in separate bags, ensuring the tent fabric is protected throughout the winter months. DON’T: Store your tent if it is damp or dirty. Storing your sleeping bags, rucksacks and camping essentials away is just as important as your tent, therefore also recommend you pack this away in a cool, dry environment. Keep all of your camping kit in the same place, making sure you know exactly where everything is when you go camping again! TIP – Do not over-pack the storage area as delicate equipment may get squashed, causing bending and breakages. Wipe down your furniture, ensuring no leftover stains or crumbs are left over. This is also applicable to cooking equipment such as stoves, pots and pans, keeping the insects at bay when in storage for a long period of time. Furniture and kitchen storage units should be carefully folded up the way they were first purchased and into their carry bag for protection. This will eliminate tables and chairs developing scratches and marks. Remove any batteries is good habit to get into, allowing you to remember to recharge them or get rid of them if they have run out. This means when you decide to go camping again, you have fully charged or brand new batteries to last you throughout your camping trips. Take care of your tent and camping essentials this winter, even if you are spending it snuggled up by the fire! Not ready to pack away your Vango kit just yet? Stay tuned for our upcoming blog highlighting our top tips for winter camping, ensuring you stay safe and warm out on your travels!